Water baptism was to manifest Christ to Israel. John 1:31. Signs were to put Christ on display to Israel. Acts 2:22. John performed no miracles, but baptized. Christ performed miracles but did not baptize. The Twelve Apostles and the Apostle Paul did both. Signs were for the same reason in the ministry of the twelve apostles. Hebrews 2:2-5. Paul’s signs were the signs of an apostle. 2 Corinthians 12:12. The Apostle Paul thanked God that he spoke with tongues more than others, but he thanked God that he did NOT baptize many believers. 1 Corinthians 14:18. 1 Corinthians 1:15-18. And let us not forget that in the matter of speaking with tongues in the assembly he said, "Let your women keep silent in the churches." 1 Corinthians 14:34. That’s right. In the matter of speaking with tongues in the assembly, the Holy Spirit, through the Apostle Paul said, "Let your women keep silent in the churches." Now let’s really get into the “meat” of this. This is a very interesting question to consider. Before we consider it, let’s note some statements in Acts 19:5-8, "They were baptized in the name of the Lord Jesus. And when Paul had laid hands upon them, the Holy Spirit came on them; and they spake with tongues, and prophesied. And all the men were about twelve, And he went into the synagogue, and spake boldly for the space of three months." These twelve men had received John's baptism. "John verily baptized with the baptism of repentance, saying unto the people, that they should believe; on Christ Jesus." Acts 19:4. John's baptism was for Israel, that Christ might be made manifest unto Israel. 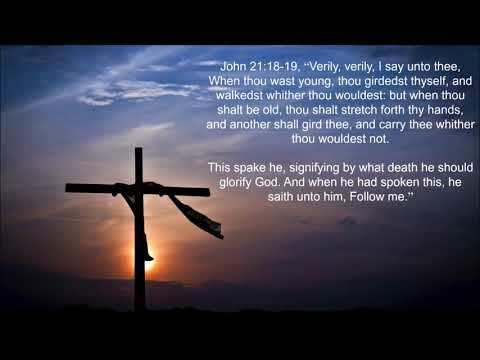 Acts 13:24 and John 1:31. Therefore, these twelve men were Jews. It is thought that they had, been instructed by Apollos, "knowing only the baptism of John." Acts 18:25. But the ORDER in this nineteenth chapter is of great interest to the student of the Scriptures for several reasons. One reason is that this is the last Scripture to record the baptism of ANYONE by water. The order was: baptism in the name of the Lord Jesus, the imposition of the apostolic hands, the baptism of the Holy Spirit, their speaking with tongues. This is the order that is generally taught and practiced in the Pentecostal assemblies. Very much the same order is found in the eighth chapter of Acts. Read Acts 8:5-15. Note the order. First, Philip, the deacon and evangelist, preached The LORD Jesus Christ in the city of Samaria, but Acts 11:19 would indicate that he preached to none but Jews in that city. Philip performed many miracles while he was preaching. The sick and the lame were healed. They believed Philip and they were baptized both men and women. Acts 11:12. But the Holy Spirit did NOT fall upon them when they believed and were baptized. Some days later Peter and John went from Jerusalem to Samaria and prayed for the baptized believers in Samaria that they might receive the Holy Spirit. They did when Peter and John laid hands on them. Acts 8:14-17. Now, AFTER the resurrection of the Lord Jesus Christ, the Savior breathed on the twelve apostles and said unto them, "Receive ye the holy Spirit." John 20:22. At least three years BEFORE they received the Holy Spirit they had received John's water baptism. Then, BEFORE Pentecost, the RESURRECTED Christ said unto them, "John the Baptist truly baptized with water; but ye shall be baptized with the Holy Spirit not many days hence." Acts 1:5. When THIS took place Peter, filled with the Holy Spirit, said, “THIS is That which was spoken by the prophet Joel." Acts 2:16. After this experience it is recorded in Acts 4:8 that Peter was filled with the Holy Spirit. Then in Acts 4:31 it is recorded that all of the apostles were filled with the Holy Spirit. Note the Apostle Paul's words to the saints, "Be filled with the Spirit." Ephesians 5:18. These saints had already been baptized into the Body of Christ. And in Ephesians 4:4-5 is recorded the fact of One Spirit and One Baptism and One Body. John the Baptist spoke very definitely of three baptisms...one with water, one with the Holy Spirit, and then another with fire. Matthew 3:11. Luke 3:16-17. Then in Luke 12:50 Christ declared that He would be baptized, referring to His death on the cross. THEN in Matthew 28:19-20, He spoke of "Baptizing them into or unto the name of the Father, and of the Son, and of the Holy Spirit." So in Matthew, Mark, Luke, and John, we find SEVERAL baptisms, but in Ephesians 4:4-5 there is ONE baptism. In Mark 16:14-18 is recorded the commission of the LORD to the eleven, “he that believeth and is baptized shall be saved," "and these signs shall follow." Christ, did NOT instruct them to preach, "he that believeth and is saved should be baptized as a witness to the world, and there are to be NO signs following faith". Servants of the LORD who proclaim this CHANGED message certainly are NOT working under the commission of Mark 16:14-18. Philip DID in Samaria. The Twelve DID on the day of Pentecost. Note carefully AGAIN the order, "Repent, and be baptized every one of you in the name of Jesus Christ, for the remission of sins, and Ye shall receive the gift of the Holy Spirit." No servant of The LORD Jesus Christ has any Scriptural authority to change this order to force it to agree with some denomination's creed and program...as many ARE doing. Here is an example of how they change Acts 2:38, "Repent and believe the gospel of the grace of God, be saved and receive the Holy Spirit to witness that you are saved and then witness your salvation to the world by being immersed in water." This truly is handling the Word of God deceitfully. Moreover, it is certainly handling the Word of God IGNORANTLY to teach that water baptism before Pentecost was a kingdom ordinance, or that “Christian” baptism began with the day of Pentecost, where these twisters of the Word of God say the ceremony took on a new meaning; namely, a witness to the world...that the Christian had been baptized by the Holy Spirit into the death of Christ, had been buried with Him by baptism and had been raised to walk in newness or life. or prophesied, or were able to discern spirits. Acts 18:8, and 1 Corinthians 12:8-11. But Paul could not remember more than a VERY FEW that he had baptized. For this fact, he said, "I thank God." Think this over. The Apostle Paul was almost willing to be accursed to get people saved, he travailed in birth until Christ was formed in some, he became all things to all men that he might save some; and still he THANKED God that he had baptized fewer than ten people out of all of the many believers in Corinth. THIS is the death blow to water regeneration, water baptism, in the Gospel of Grace. Of course at the time he was preaching to the Corinthians he did NOT know that he was going to write a letter to them later on rebuking them for their carnal divisions. But, that was not the reason he did not baptize them. "Christ sent me NOT to baptize" 1 Corinthians 1:17. Regardless of the interpretation and mode of water baptism preached and practiced by any Christian, or group of Christians, all Christians should acknowledge that Christ sent the twelve to baptize, but NOT Paul. Did Paul say, "I thank God that I did not perform the ceremony that would have been their witness to the world?" He knew, and we should know, it was no such thing. Then of course comes the question, why did Paul baptize those twelve Jews in Acts 19, or Lydia, or the Philippian jailer? Right after Paul baptized the twelve Jews we read that he healed many people by using handkerchiefs and aprons. We read that when Lydia was baptized they had been assembled on the Jewish Sabbath. When the Philippian jailer was baptized there was a miraculous earthquake. On the day of Pentecost there were supernatural demonstrations, the mighty wind and tongues. We have already observed that when Philip was baptizing in Samaria he was performing miracles. We have NOTED that in the commission of Mark 16:14-18 the LORD's order was, Faith, baptism, salvation, signs. Now again note the order in Acts 19:4-7, water baptism, imposition of hands, Holy Spirit baptism, speaking with tongues. Thus we see that we find in the Scriptures: signs, sign gifts, supernatural visitations, and manifestations, angels and miracles are linked with water baptism. Any exegesis that will eliminate the miraculous signs will ALSO eliminate the water ceremony. So, AGAIN, Water baptism was to manifest Christ to Israel. John 1:31. Signs were to put Christ on display to Israel. Acts 2:22. John performed no miracles, but baptized. Christ performed miracles but did not baptize. The Twelve Apostles and the Apostle Paul did both. Signs were for the same reason in the ministry of the twelve apostles. Hebrews 2:2-5. Paul’s signs were the signs of an apostle. 2 Corinthians 12:12. The Apostle Paul thanked God that he spoke with tongues more than others, but he thanked God that he did NOT baptize many believers. 1 Corinthians 14:18. 1 Corinthians 1:15-18. And let us not forget that in the matter of speaking with tongues in the assembly he said, "Let your women keep silent in the churches." 1 Corinthians 14:34. That’s right. In the matter of speaking with tongues in the assembly, the Holy Spirit, through the Apostle Paul said, "Let your women keep silent in the churches." 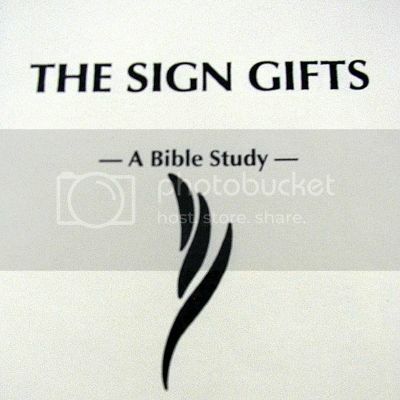 In this message we will look at...The Biblical Sign Gifts...When Did They Cease! In the first six letters, all written during the period covered by the Book of Acts, we find that the sign gifts, including water baptism were operating in all these churches. All through the Book of Acts we read of tongues, the gift of prophecy, the gift of healing, etc. We read of, tongues and prophecy in Acts 19:6, the gift of prophecy in Acts 21:10-14, the gift of healing in Acts 19:11-12 and Acts:28:8-9, and so on. Correspondingly, in the "Acts Epistles" we read of the gifts operating in the churches that the Apostle Paul founded. In Galatians 3:5, 1 Thessalonians 5:20, 1 Corinthians 12, 1 Corinthians 13, 1 Corinthians 14, 2 Corinthians 12:12, and Romans 12:6, in all of these we read about the gifts in operation right through to the end of the Book of Acts. But, during this time in the Book of Acts, the RISEN Christ revealed to the Apostle Paul that the sign gifts were going to cease, as we read earlier in 1 Corinthians 13:8-12. The gifts were all in operation all through the Book of Acts period and are mentioned in the letters written during that time, but, again, the LORD Jesus Christ had revealed that the sign gifts were going to cease at some time in the future. Now we turn to the prison epistles, the four letters written shortly after the end of the Book of Acts, while the Apostle Paul was a prisoner in Rome, these are Ephesians, Colossians, Philemon and Philippians. In them we find that there is not one word about tongues, or the gift of healing. Even where we might have expected the Apostle Paul to write of tongues in the passage about being "filled with the Spirit" in Ephesians 5:17, he has nothing to say about tongues. Then, concerning the gift of healing, we read of a co-worker of the Apostle Paul's, Epaphroditus, who fell seriously ill during this time, Philippians 2:25-30, and the Apostle Paul no longer had the gift of healing, and was no longer able to heal as he did only a few years earlier in Acts 28:9. The sign gifts were no longer operating at the time that Paul wrote the Prison Epistles. So, we ask, can tongues be found in the Pastoral Epistles? In the 3 Pastoral Epistles, as in the prison epistles, we do not read of tongues or the gift of healing operating at this time. We do read of prophecies that had BEEN made about Timothy in 1 Timothy 1:18, 1 Timothy 4:14, and 2 Timothy 1:6, but these were given years before. So far as we read in these three letters, we wouldn't even know that there had been a "gift of tongues." And, again, in places where we would have expected the Apostle Paul to mention the sign gifts, he is silent. When Paul gives Timothy and Titus instructions regarding the choice of men to be elders in the churches, Paul says nothing about the desirability of these men having a gift such as prophecy, or healing, or other sign gifts (Titus 1:6-9, and 1 Tim. 3:1-10). The gifts of tongues, prophecy, etc., were no longer in operation by the time the Apostle Paul wrote the pastoral epistles. It is clear that the gift of healing has ceased because, as in Philippians, Paul was no longer able to heal, even his co-workers. Timothy was suffering stomach problems and frequent infirmities (1 Timothy 5:23) and the Apostle Paul can't heal him, also, he doesn't recommend that he go to a healer in the church, doesn't send a prayer cloth or a bottle of anointing oil (remember the miracles of some 8 years earlier in Acts 19:11-12). Likewise in 2 Timothy 4:20, Paul has to leave behind his co-worker Trophimus who had fallen sick on the last journey. The Apostle Paul's gift of healing (Acts 28:9) was no longer operating in Philippians 2:27, 1 Timothy 5:23, and 2 Timothy 4:20. The sign gifts, water baptism, tongues, prophecy, the gift of healing, etc. were operating all through the Book of Acts, and these gifts are mentioned in the letters that the Apostle Paul wrote during the Acts period. But when we turn to the letters written AFTER the Book of Acts (the 4 Prison Epistles, and the 3 Pastoral Epistles), we find that the sign gifts either aren't mentioned at all or we see, as with the gift of healing, that they were no longer operating in the Apostle Paul's life. What he could do in Acts 28, he could no longer do in Philippians, or in 1 Timothy and 2 Timothy. He could heal all the sick on the island in Acts 28:9, but he couldn't heal any of his closest co-workers...Timothy, Epaphroditus, Trophimus…after the close of the Book of Acts. The sign gifts were operating in Acts, and in all of the Acts Epistles: Galatians, 1 Thessalonians, 2 Thessalonians, 1 Corinthians, 2 Corinthians, and Romans. Let’s take note again, in this time period, in 1 Corinthians 13:8-12, the Apostle Paul tells us that Christ had revealed to him that these gifts would cease someday. THEY DID. In the letters written after the Book of Acts, the sign gifts had ceased, just as the RISEN Christ said that they would. The pattern could not be clearer, and the contrast could not be sharper between the earlier letters and the later letters, between the times when all the sign gifts were operating, and the time when all the sign gifts had ceased. Therefore, we can now give a scriptural answer to the question that we started with: when did the sign gifts cease? The answer is that the sign gifts ceased at the end of the Book of Acts. There is no record in Scripture of any of the sign gifts operating in any of the letters that Paul wrote after the end of the Acts period, and it is clear that the gift of healing had ceased since the Apostle Paul could no longer heal even his closest co-workers after the close of the Book of Acts.